Meet MA9000, the most powerful McIntosh integrated amp ever | What Hi-Fi? The MA9000 integrated amplifier delivers 300 watts of power per channel, and is able to handle hi-res audio up to DSD256 and DXD 384kHz standards. Huge in size, huge in power: McIntosh's new MA9000 integrated amplifier ticks both hugeness boxes. 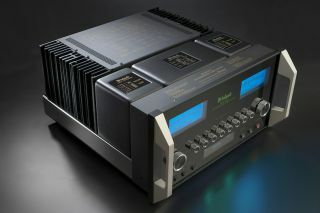 Power-wise, it puts out 300 watts per side, which McIntosh guarantees will drive any speaker "regardless of impedance." The MA9000 has a built-in 32-bit DAC, and a DA1 Digital Audio Module with USB input that can support DSD256 and DXD 384kHz files. The module is replaceable should the need arise. There are two digital coaxial and two digital optical inputs (capable up to 24-bit/192kHz) and an MCT input for connection to other McIntosh equipment. The ten analogue inputs comprise two balanced and six unbalanced connections plus a moving magnet and a moving coil phono inputs. Both phono inputs have adjustable loading. In terms of outputs, the McIntosh will drive two pairs of speakers and has a discrete headphone amplifier. If you want to pick one up you'll have to wait a little for the UK price, but in the US shipping begins this month. The MA9000 will cost $10,500.